The St. Louis Cardinals only scored a single run during their 2-1 loss to the Chicago Cubs on Tuesday. And while Stephen Piscotty‘s trip around the bases wasn’t enough to get the Red Birds the win, it will still be recognized as perhaps the hardest-earned run in the history of the game. It all started when Piscotty was hit by a Jake Arrieta pitch in the right elbow. Then, while stealing second, he was hit in the left elbow by the throw from Cubs catcher Willson Contreras. 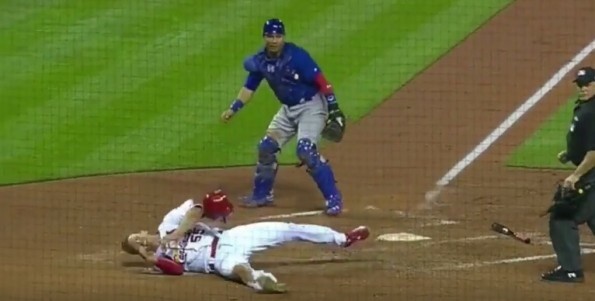 And finally, after a little dribbler handcuffed the entire Cubs infield, Piscotty successfully made it from second base all the way home, but while sliding to the plate, he took a Javier Baez throw to the head. He was forced to leave the game with a head contusion. All of that for a single run. In a losing effort. You’ve got to appreciate the heart, though.